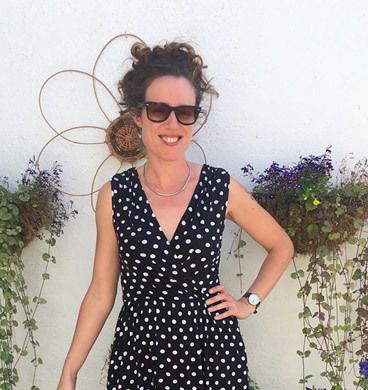 Hi there, I’m back to sewing and blogging after a few months maternity leave and am sharing a summer make I managed to get finished just in time for my holiday (and the weather turning much chillier—boo!). I love wearing dresses and have sewn loads of them, but have recently been on a quest for more separates in my me-made wardrobe as they are much more versatile for styling—not to mention being easier for breastfeeding purposes. I’ve sewn lots of knit fabric tops, but wanted to add more looser-fitting woven ones to my summer wardrobe as they tend to be so much cooler in the heat—not to mention the looser fit being more flattering over my (hopefully temporary) post-baby tum! This pattern probably needs no introduction as just about every sewing blogger seems to have made it, but can you believe this is my very first Grainline Patterns Scout Tee?! I’m not sure why it took me so long to getting around to joining the party, but it probably has something to do with my stubborn resistance to following the latest trends as I don’t want to look like everyone else. However, sometimes things are popular for a very good reason, and fortunately this is one of those cases. The paper pattern comes printed on tissue, with a nifty little pattern booklet that gives a really good step-by-step for sewing beginners. My only real criticism of the pattern instructions are that all the measurements are imperial, which was a little annoying when sewing on a metric machine as I had to convert the measurements myself—the seam allowance was mainly half an inch, but a quarter of an inch on the neckline. In the end I just eyeballed the seam allowance with the assistance of my quarter inch presser foot. I wanted a summery, tropical vibe fabric for my tee, but I was wary of all the more colourful fabrics on offer. Sure, they might look great for a kimono, but would they suit me up close to my face? The idea of sewing something so basic in a solid bored me to tears, though. In the end I found a compromise in this Double Gauze Fabric, which looks like a chambray but is printed with a tropical leaf and flower pattern in navy. Perfect! I have to admit, I was a little flumoxed when I saw the reverse and realised how easily if frayed, as I knew this was going to give me major issues with cutting out the bias strip for the neckline facing. However, I went ahead and chucked it in the washing machine and tumble drier to get any shrinkage out of the way while I decided what to do. And when it got it out… Wow! I don’t think I’ve ever seen a fabric change so much during the prewash. It went in a really flat and smooth fabric, and it came out with this amazing drape and soft hand. It also looks different: rumpled and textured in a really attractive way. It reminds me of linen, and I reckon if you’re a fan of linen you’ll love this fabric too. My measurements were just half an inch either side of the size 12 (my waist was narrower, my full bust and hips wider), but I figured I’d cut a straight size 12 as I’m currently losing weight, and I could always sew the waist narrower later if I felt it needed it. At 144cm wide I really should have ordered 1 ¾ yards of fabric for this size, but I’d done a bit of research and reckoned my 1m would be enough. I was absolutely right, although I’m not sure I would have managed it if I’d cut the bias strip from my main fabric too. Construction was pretty straightforward. I read the instructions then did my own thing, like setting the sleeves in flat, and finishing the neckline before sewing the side seams. I’d originally planned to French seam everything, but decided to trial out a few different seam finishes as the fabric was much thicker than expected. The French seam looked great, but was too bulky for my liking, and the plain overlocked seam didn’t lie flat enough without topstitching it down, which I didn’t want to have to do. In the end I overlocked all the raw edges (except the neckline) before sewing the seams with my regular sewing machine, and pressed them open to give a nice flat finish on the outside. This was a really easy make, and the only challenges were in dealing with a fabric that frayed like crazy. I used a little Fray Check on the ends of my overlocked edges to make sure they didn’t come undone, and I really should have staystitched the neckline as despite my careful handling it stretched out of shape and frayed before I came to finishing it. It was easy enough to fix by sewing a line of easestitching and gently pulling it back into shape, and fortunately the bias tape covered the fraying. So, what about the finished article? Well, I can see why this is such a popular pattern as the fit is reasonably good straight out of the packet, despite it having no bust darts. I think in future I probably should size down for my narrow shoulders and do a full bust adjustment as well as a swayback adjustment, but for a casual, less fitted top I really like this. The double gauze is also one of the most comfortable fabrics I’ve ever worn so it gets top marks there. Gotta love some secret pyjamas! It’s a little warmer than I expected due to the thickness of the double fabric, and this top probably wouldn’t have worked for the heatwave, but is perfect for the usual British summer weather. I reckon it will get worn most of the year with a cardigan too! Right, I’ll be back next month with another addition to my post-baby wardrobe. Until then, happy sewing, everyone!